One thing I have never quite mastered is meal planning. I know my life would be simpler if I made a meal plan, but I never remember. I should go do that as soon as I'm done writing this post. We will see! Anyhoo, how does one who does not plan meals ahead manage to come up with anything for dinner? Well, I'll tell you. I try to keep standard (for me) ingredients on hand, so when I'm ready to make dinner, I can take some meat from the freezer (or, hopefully remember to thaw it the night before) and pull something together. Sometimes this works better than others. Occasionally, when my husband asks what we're having, I reply with something like, "Funny you should ask! It started out to be one thing, but when I started to make it, I realized I didn't have everything for the recipe, so I had to improvise." Heh. I love to use my slow cooker. There are a couple of nights each week that go much more smoothly if I have dinner in the crock pot. This last week I made a recipe I hadn't made it quite some time, remembered how much I enjoyed it, and thought I would share it with you! It's from a lovely cookbook called Slow Cooker Ready and Waiting, by Rick Rodgers. Actually, the version I have is (ahem) a few years old and it's simply called Ready and Waiting. The recipes in this book are fabulous. Mr. Rodgers calls for real, whole foods, and while they do take some planning and preparation time, they are worth it! In a large skillet over medium-high heat, cook the ground beef, onion, and garlic, stirring often to break up lumps, until the meat loses its pink color, about 5 minutes. Tilt the pain to drain off excess fat, then transfer the beef mixture to a 3 1/2 quart slow cooker. Add the tomatoes with their purée, the tomato sauce, Italian seasoning, and pepper, stirring to break up the tomatoes with the side of a spoon. Cover and slow-cook for 7 to 8 hours on low (200˚ F). Skim the fat from the surface of the meat sauce. Stir in the cooked pasta, spinach, and ricotta and Parmesan cheeses, and slow-cook for 5 minutes. Serve the casserole directly from the slow cooker. This recipe was posted with permission of the creator, Rick Rodgers. My husband requested that I leave the spinach out, so I have. I make my own Italian seasoning from this recipe. I ran out of Italian seasoning from my little jar one night, so Googled how to make my own. It's easy to do, I had all the listed ingredients, and one batch lasts a long time. It does say to combine the ingredient in a spice grinder, but I don't have one, so I just mixed them together and put them in a little container. We like it with cottage cheese just as well as with ricotta cheese. Oh yum! That recipe looks lovely! PS- I found your blog via the BYB series. Yuliya, that is so funny - I am exactly the same way! If I have a meal plan, someone won't be in the mood for what it says - probably me. Ha! I can't stand it when they ask what's for supper. If I tell them, at least one will start complaining. I mostly say I don't know, or you'll find out when you eat it, lol. I'm sure gonna try this recipe. It sounds so good. Thanks for participating in the boost challenge. And thanks for visiting my site. Julie, do you know what drives me MAD? Each of my three coming into the kitchen at different times, usually within about 5 minutes of each other, to ask what's for dinner. :-D Sometimes I think when the first one asks I should just assemble them all in one place and tell them. Now that I think about it, if I actually made a meal plan, I could just post it in the kitchen and point them to it! As mine got older I made a rule, "If you ask what is for dinner the answer is whatever you cook!" This sounds like an awesome recipe. I am always looking for crockpot or slow cooker recipes. So thanks for a new one to try! 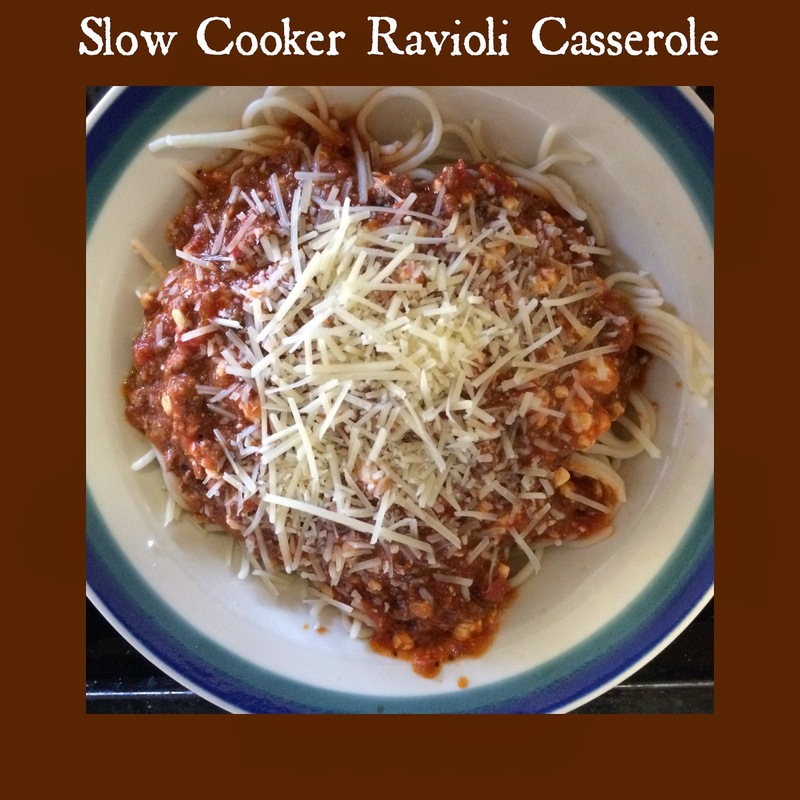 I love a good slow cooker recipe and this looks delicious. Thanks for sharing it! That looks really yummy! Just introduce the kids to ravioli, which was a big hit. We may need to try this! This looks yummy. I'll have to include it in my meal plan. Visiting from the Boost Your Blog challenge. Stopping by and following via Bloglovin from BYB. Looks delicious! But I'd leave in the spinach :) I'm looking forward to giving this a try - looks like something my whole family would enjoy! I like using my Crock Pot and have not come across this recipe. I will need to give it a try. This looks so delicious!! Already pinned it and can't wait to try it!! Thanks!